Take a look at the chart below. 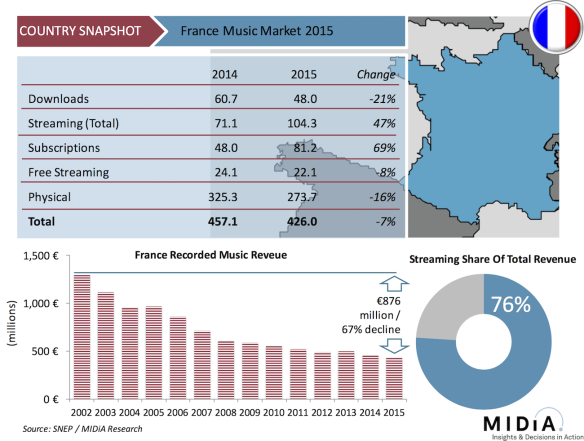 It shows that the French music streaming has increased by a whopping 47% last year. At the same time you can see from the chart that downloads and Physical are both declining by -21% and -16%. Subscriptions is up by 69% which is pretty impressive. Free streaming is also up, but only by 8%. All in all you can see from the chart that the French recorded music market registered a whopping 7% decline last year. French music had another 7% decline in 2014, and the result is that France`s recorded music market is 67% smaller that it was in 2000. We are talking about €876 million and this is heart breaking. Streaming goes straight up, while the revenue goes straight down. We know that 99% of the French people listen to music, on average 2 hours and 25 minutes per day, and 3 out of 4 French people could not live without it. So, streaming should continue to rise in the future. Streaming is very important, but is still a minority player in France, increasing its market share from 16% in 2014 to 24% last year. Downloads declined and lost revenue of €12,7 million which is half the amount that streaming grew by €33,2. If you add the decline in downloads sales and physical sales together, you find that the amount is double what streaming added. Download and physical sales declined by €64,3 million, so revenue from streaming in France has to double to fill that gap. I belive that many of the consumers in the streaming market are the same in the download and physical market. What we see is a shift from a sales model to an access model. You can imagine how easy it is to be a DeeJay now as you can pay only $9,99 for 30 million songs instead of buying each and one of them. According to the French government, the music industry represents about 241,000 jobs in France, and one of the French export champions is the 48-year-old DeeJay David Guetta who have sold 9 million albums and 30 million singles worldwide. David Guetta`s father is of Moroccan Jewish descent, and in 2013, Billboard crowned his hit «When love takes over» as the number one dance-pop collaboration of all time. The unemployment rate is extremely high in France, but David Guetta is not in that category. The France unemployment rate is 10,3% (near all-time high of 10,7% in 1997). This is the number of people looking for a job as a percent of the labour force. The France youth unemployment rate is even more shocking at 25,9% (near all-time high of 26,2% in 2012). France has a huge social problem and the suburb residents are mostly Arab or African, often Muslim and poor. One out of three live below the poverty line. The suburbs are zones of separation. Those outside Paris are set apart from the capital by pèriphèrique, a roaring eight-lane road that encircles the city. On one side is success, culture, and wealth (Modern France). On the other is the banlieue (a place Parisians never go). Some 7,5% of French live in this «other France». France claims the greatest social equality in the world and officially bans ethnic and religious identification, and Marine Le Pen`s far-right party is growing. Their campaign target minorities, implying they were unwanted and un-French. Not only the suburbs of Frances cities are home to the countrys poor. People living in rural areas are «descending into poverty», and many of them can feel socially excluded. They are all potentially streaming consumers.